Air Wallpaper: . : Dream Fragments :. Minitokyo »	Air Wallpapers » Air Wallpaper: . : Dream Fragments :. The sky on this is really amazing, the coloring, the clouds, the stars you can really tell there was a lot of attention to detail here. This wallpaper is more than just a cute girl it has emotion with it and i really have to tell you job well done with that. I cant tell if the scan needs cleaning or you were just giving it a textured look but I do wish the girl "popped" a little bit more. But overall this is really great. Its going right to my favorites. wow! 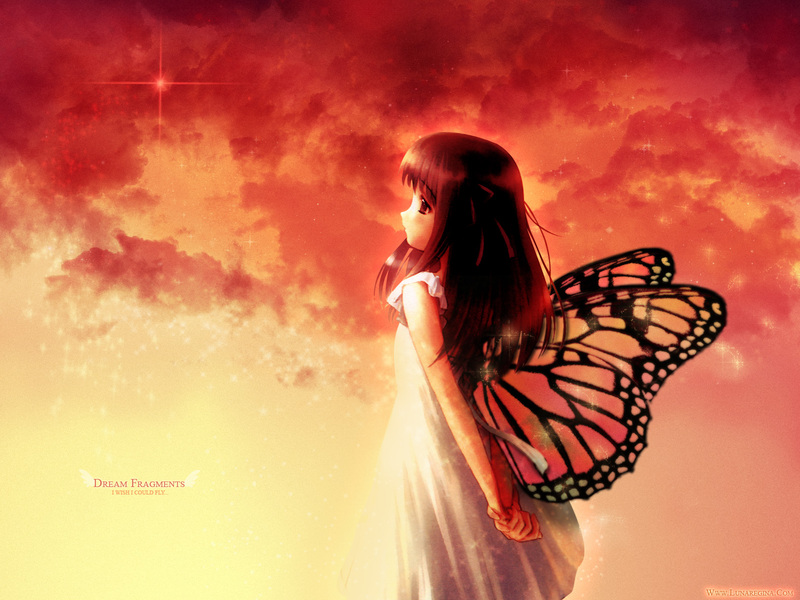 this is a really nice wallpaper and i love the butterfly wings you put on the girl. the background and the sky's amazing! Very very pretty background and character. I love the colours too. Added to my favourites ^__^ . Oh how cute!!!! I love the little girl! She's SOO cute! All together nice job lunaregina! Adding to favs! I love the background. is a excelent I love the color and texture. is real... nice job ^^ Keep waking!!! nice wallpaper, the chara is very pretty and the background has great colors. Awesome cloud work and I must say this is the first wall I've seen use butterfly wings effectively. They look as if they were originally a part of the scan and they suit the character well. And the texture of the wall adds a nice nostalgic feel to this. Great work! Beautiful! The colors are amazing! Nothing more to say: just amazing! this wallie ish really amazing ..
the clouds rock .. and the color scheme and the scan .... <3 <3 <3 gotta heart em ..
the background is great and the character is so cute too! Good heavens! I am not much of a waller, so I won't give you any praise / criticism, let me just say simply that I like it a lot. wow, this wall is amazing. 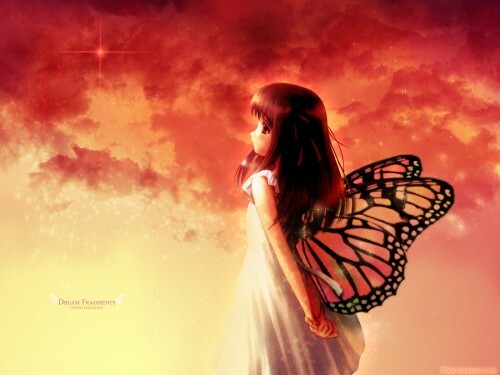 The sky is beautiful, the girl is really cute, and the wings are so pretty. :) :) :) Adding to favs, well done! Background is just sublime, the clouds are so well done, and the colouring. The light effects are well applied too, both to the clouds and the girl. Butterfly wings suits her well. Captions fonts are nice too. This wallpaper actually evokes emotions with its colours and that sad look on the girls face, good job on that. the orange clouds n sky r very well made..
wahhh niceeee very beautiful^^ great work with the wings, nicely put together. and i gotta say this is a very warm wallpaper though the girl looks kidda sad. the colours matches with the scan perfectly. well done! !